Day One: Participants will receive a primer on the basics of MF/UF and MBR applications and Membrane Math, which will assist in better understanding the presentations that follow. 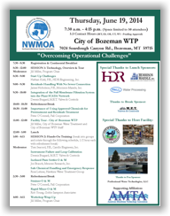 Day Two: Water and wastewater topics will split into two focused consecutive tracks followed by hands-on training and case studies. Day Three: Concludes with a Panel/Group Discussion focused on a Universal Skid for MF/UF. 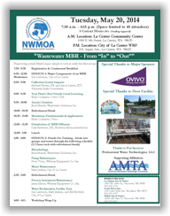 There will also be an overview and facility tour of the City of La Center’s Water Plant. On-Line Registration for this event is now closed. 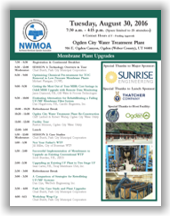 Registration will open On-Site at the Hotel at 9:00 a.m. on August 4th. Make your lodging arrangements directly with the Hilton Vancouver Washington by clicking the link or by phone at 800-643-7892 and refer to NWMOA group code: MOA for the discounted room rate. A group rate for single/double of $126 has been negotiated for reservations made by July 20, 2014 (subject to availability). If you would like to register for this workshop, please print and fill out the Registration Form (click image, on the last page of the brochure) with payment information and submit via email: regassist@nwmoa.com, fax: 772-463-0860, or phone: 208-577-6519. 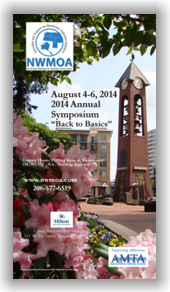 Onsite registration will be available at the NWMOA Registration Desk starting at 7:30 a.m. Thursday, June 19, 2014. 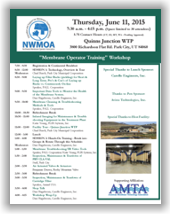 If you would like to register onsite for this workshop, please print and fill out the Registration Form (click image, on the last page of the brochure) along with payment information and turn it in at the onsite NWMOA registration desk. 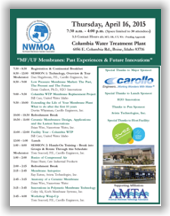 Onsite registration will be available at the NWMOA Registration Desk starting at 7:30 a.m. Thursday, April 16, 2015. 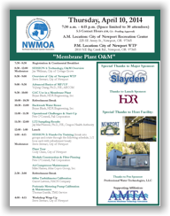 Onsite registration will be available at the NWMOA registration desk starting at 7:30 a.m. Thursday, June 11, 2015. Announcing a return of the RO Workshop Series! 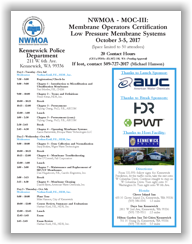 An informative day on the topic of water treatment using reverse osmosis. 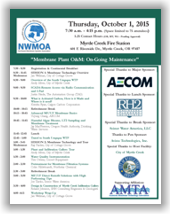 Registration fee is $75 for AWWA, WEF and NWMOA members ($95 for non-members). Lunch and refreshments are included. There will be time for Q&A and networking! Click on the image to learn more or to register. 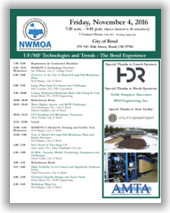 This AMTA/NWMOA/WEF Technology Transfer Workshop will focus on applying membranes to drinking water, wastewater, and reuse applications. 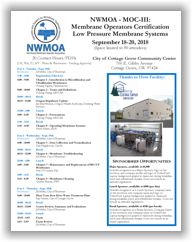 There will be tours of two full-scale facilities that use membranes – the North Clackamas Water Treatment Plant and the La Center Wastewater Treatment Plant. 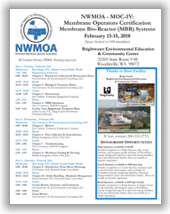 The workshop will also cover topics such as Membranes in Reuse Applications, MBR Case Studies, MF/UF uses in Drinking Water, New Technology and Trends, and an Operator Roundtable. 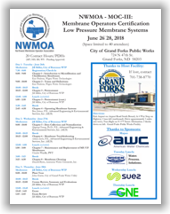 Added Session: Thursday 12:15 – 1:00 p.m. – Evan Hofeld, Oregon Health Authority – Implementation of a Universal Human-Machine Interface (HMI) Format for MF/UF Systems Installed to Meet Requirements Under Federal Safe Drinking Water Act. Make your lodging arrangements directly with the Hilton Vancouver Washington by clicking the link provided or by phone at 800-445-8667 and refer to AMTA for the discounted room rate. A group rate of $145 for guest rooms (single/double) has been negotiated for reservations made by June 20, 2016 (subject to availability). 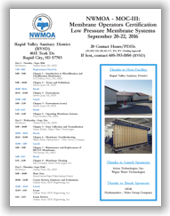 NWMOA Membrane Operators Certification – MOC-III: Low Pressure Membrane Systems – Fargo, ND – May 16-18, 2017 @ Oak Room - Fargo Cass Public Health Bldg. 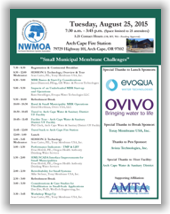 This AMTA/NWMOA Joint Technology Transfer Workshop will focus on membrane use in treating difficult water. 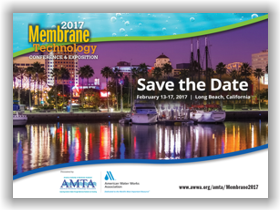 Attendees will learn about how membranes are being used to address wildfire runoff, very cold water, and other difficult to treat waters. 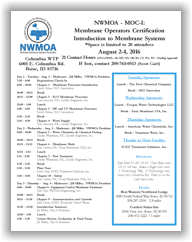 Topics covered will include water quality concerns after a fire, considerations in treating very cold water, selecting the right membrane for the application, pretreatment considerations, and several case studies. 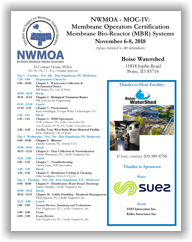 The workshop will include an overview and tour of the City of Bozeman 22 MGD Water Treatment Plant. Make your lodging arrangements directly with the Hilton Garden Inn Bozeman by clicking the link provided or by phone at 1-877-782-9444 or 406-582-9900. Refer to AMTA17 for the discounted room rate. Make your reservations by June 12, 2017 and save! 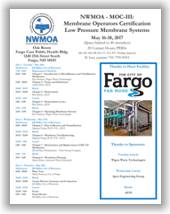 Registration fee is $85 for AWWA, WEF and NWMOA members ($105 for non-members) before August 30, 2017. Lunch and refreshments are included. 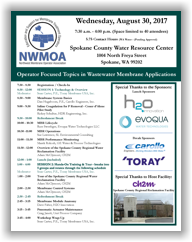 If you are interested in entering the 2018 Best Tasting Membrane Water Competition please submit a completed entry form to NWMOA by Friday, June 29, 2018.